No matter what size or type of business you’re in, this book provides you with an unbeatable competitive advantage in the booming global marketplace for new products and services. Robin Karol is CEO of the Product Development and Management Association (PDMA), a professional society that creates and nurtures a global community in which people and businesses learn to grow and prosper through innovation and the introduction of new products. Robin is an adjunct full professor at the University of Delaware Lerner School of Business Administration, where she teaches courses on the Management of Creativity and Innovation. Robin worked at DuPont for 23 years in various aspects of innovation and new product development, achieving the role of Director of Innovation Processes. A certified new product development professional (NPDP), she received her PhD in Biochemistry from the State University of New York at Buffalo. She has numerous publications and has presented at many conferences and workshops. The Industrial Research Institute (IRI) presented Robin with its Maurice Holland Award for the best paper in its journal Research-Technology Management in 2003. Beebe Nelson is Co-Director of the International Association for Product Development (IAPD), a consortium of leading product developers who come together to improve their ability to execute new product development. She has organized, chaired, presented at, and facilitated conferences and workshops in product development, and has contributed chapters and articles in a number of venues. From 1998 to 2003, she was Book Review Editor of the Journal of Product Innovation Management, a publication of the PDMA. Beebe is a certified new product development professional (NPDP) and holds a doctorate in philosophy from the Harvard Graduate School of Education. Beebe has taught Philosophy at the University of Massachusetts at Boston and most recently in the College of Management at UMass-Lowell. She chairs the Advisory Council of Partners in Ending Hunger, a not-for-profit organization located in Maine. 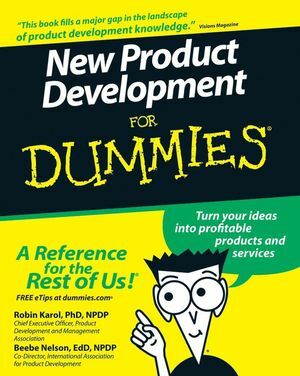 Part I: The Basics of New Product Development. Chapter 1: It Takes a Company. Chapter 2: What Are You Developing, and Why? Chapter 3: Defining Your Product Strategy. Part II: Charting the Ocean of Opportunity for New Products. Chapter 4: What Do Your Customers Really Want? Chapter 5: Turning Your Company into an Idea Factory. Chapter 6: Picking Winners and Losing Losers. Chapter 7: Making the Most of Technology. Chapter 8: Focusing Your NPD Efforts. Part III: Navigating the River of Product Development. Chapter 9: One Foot in Front of the Other: The Product Development Process. Chapter 10: Organizing the NPD Troops. Chapter 11: Managing Your Corporation’s NPD Resources. Chapter 12: Using Reviews to Keep Projects on Track. Chapter 13: Launching Products for Market Success. Part IV: New Challenges in Product Development. Chapter 14: Developing Products in the Digital Age. Chapter 15: Product Development Goes Global. Chapter 16: Choose Your Partner! Partners in Product Development. Chapter 17: Ten Ideas on Ways to Test Your New Products. Chapter 18: Ten (Or More) Ways to Track Your Innovation Efforts.